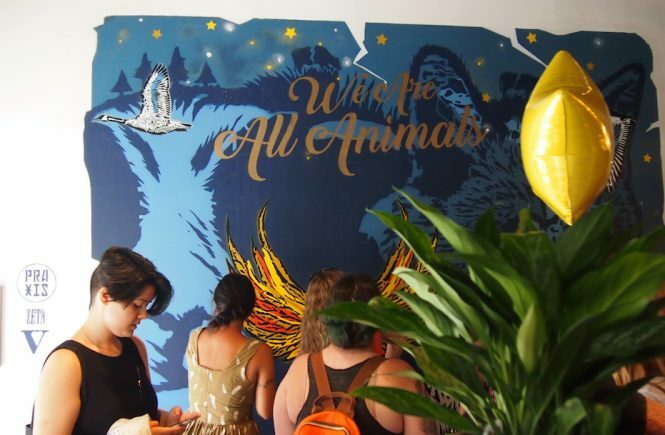 Cheese, in my humble, hungry opinion, is THE perfect food: oozy, goozy, savory and… well, cheesy. 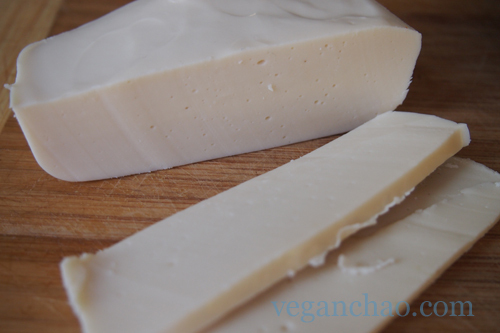 It didn’t help that pretty much every vegan “alternative” to cheese was watery, tasteless and pretty much über-vile. After going through nasty rice, soy, and nut cheeses (which will not be named out of respect ;) ), I pretty much had nothing to lose when I finally got around to trying Daiya. 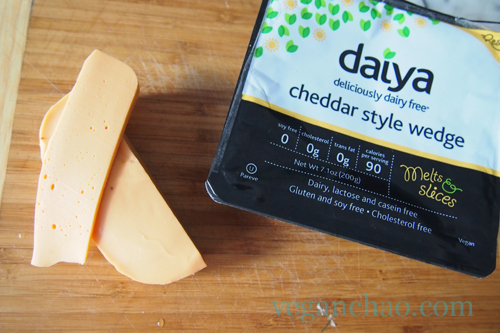 Daiya is, by far, the best mainstream vegan cheese product I’ve tried. I already love their cheesy shreds, so when they came out with cheese WEDGES, I just flipped– some grilled cheese bread, that is! 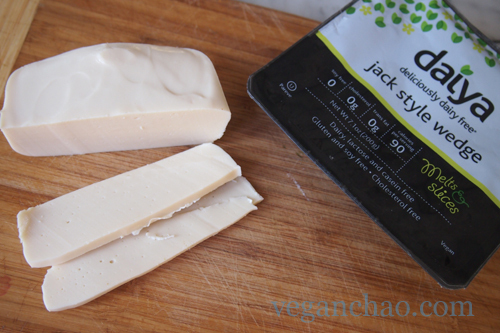 What separates Daiya from every other vegan cheese out there is the consistency. It melts like cheese, tastes delicious enough to stand in for real cheese, and can be used in any traditional use you would have for regular cheese (mmmmacaroni!). That stringy, sticky effect that happens when you tear apart melted cheese… on pizza or bread? Yeah, Daiya gots it. 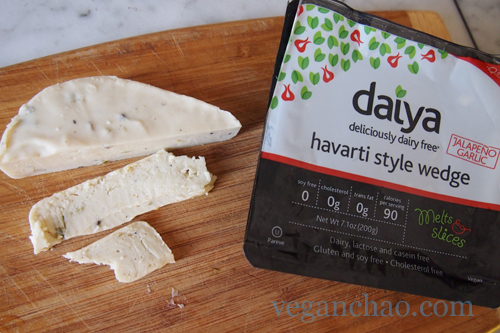 My favorite flavor is the Havarti wedge– which, for obvious reasons (ate almost all of it!) was not in the video. 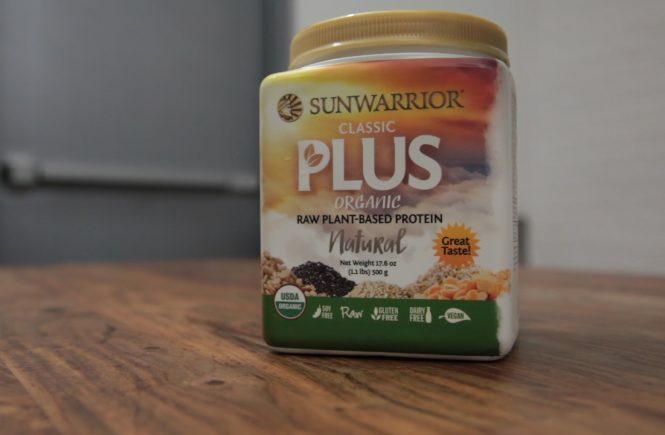 It has garlic, cracked black peppercorn, jalapeno and diced spring onion right in the cheese, which lends it a spicy, sharp flavor that works great with tacos, in dip… and probably AWESOME with nachos. 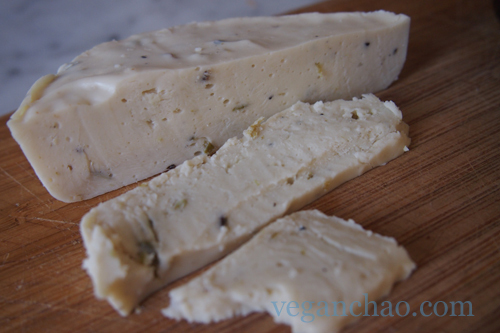 The added spices and seasonings really MAKE this cheese that more tasty. Smooth and buttery-soft… with just a bit of kick, the jack-style wedge is perfectly meltable (see it in action above!). It’s my second favorite flavor and it’s just a teensy bit stinky, which is nice, since I’ve always appreciated the stinkiness of a good cheese. Jack-jack would certainly approve (and probably be fooled) by this little cheese. Tastes great melted, or purely out of the fridge, popped in your mouth! Last but never least, the cheddar-style wedge is the chameleon of cheese: tastes just as good sprinkled on a burrito as it does melted atop pizza. It’s my go-to flavor when making mac n cheese… there’s nothing like that creamy yellow color on those silky-soft elbow noodles. Yum! 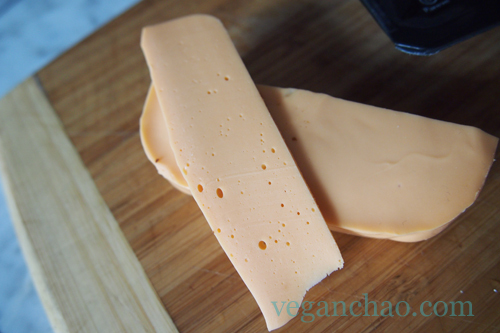 Classic cheddar, just like Kraft… without the added hormones or animal fat! The cheddar wedge definitely has the strongest scent out of all the cheeses… not that that’s a bad thing! So the only thing I want now is a mozzarella-style wedge. C’mon Daiya, it’s practically its own food group!